Merlyn has a home! 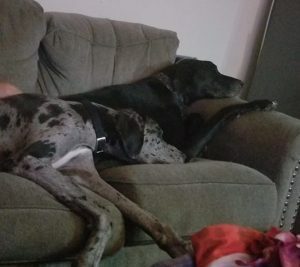 - Rocky Mountain Great Dane Rescue, Inc.
Merlyn has a home with his forever family in Lakewood, CO! Andrea and Craig, and their daughter Megan, are so happy to bring sweet Merlyn into their home! Merlyn will share his new family with 5 year old Zoey, who is also a Dane. Zoey is a playful, sweet girl, so Merlyn will have someone to teach him the ropes, and a playmate to use up his puppy energy with. Merlyn will enjoy going for long walks, and lots of outdoor time in his new huge back yard. Andrea is home during the day, so Merlyn will have all the attention and companionship he desires. Andrea also volunteers with RMGDRI, so you may see Merlyn at a local CO event in the future. We are so excited for Merlyn and his new family! Happy life sweet boy!